Simple, Bright and no-wire design avoid troubles and save money as installation charge. Remote control range up to 100 meters in open air. Wireless - easy to install. Just remove the sticker and paste it to the place of your choice. Heady Daddy Wireless Multi Music Assorted Design Door Bell Alarm is a premium quality Door Bell from Heady Daddy. Moglix is a well-known ecommerce platform for qualitative range of Door Bell. All Heady Daddy Wireless Multi Music Assorted Design Door Bell Alarm are manufactured by using quality assured material and advanced techniques, which make them up to the standard in this highly challenging field. 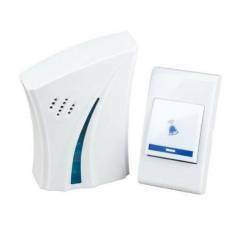 The materials utilized to manufacture Heady Daddy Wireless Multi Music Assorted Design Door Bell Alarm, are sourced from the most reliable and official Door Bell vendors, chosen after performing detailed market surveys. Thus, Heady Daddy products are widely acknowledged in the market for their high quality. We are dedicatedly involved in providing an excellent quality array of Heady Daddy Door Bell.